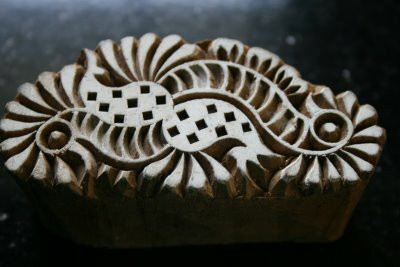 The craft of block making came to Rajasthan along with printers from Sind-Punjab. Most of the block makers in Rajasthan are Muslims. The basic carving tools are made by block makers themselves form iron rods, bicycle spokes etc. The ‘design” is first drawn on paper and stretched out on smooth surface of wood. The motif or design is then pierced through the needles so that the “impression” is transferred on the smooth surface of wood, later the unwanted areas are carved out. Iron nails and woolen-felt are also used to improve the quality of impression. 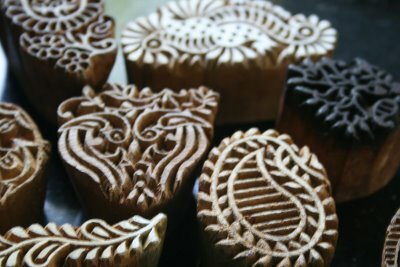 Wooden block can be classified in three types viz ‘Rekh’- the outline block, “gudh”- the background block, and “Datta’- the filling block. ‘Gudh’: The block which covers the background of patterns in called gudh. 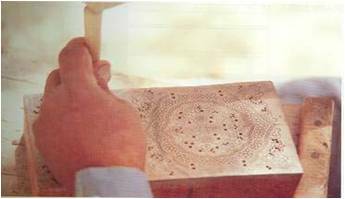 Gudh is sometimes treated as the key block and printed first.